In fact all the options for a new runway have been examined many times before (1953, 1970, 1993 and 2003) and have always been found impracticable. The line of the runway shown in the 2012 Master Plan (as referred to in the GAL press release, and for which land is at present safeguarded) is too close to the existing runway to allow a new terminal and space for aircraft to manoeuvre on the ground. That was the view of British Airways. There is high ground at the western end and the main railway line at the eastern end, so the runway would have to be short. The runway would be only a few hundred yards north of Crawley residential areas. More generally the expansion of aviation is largely due to the fact that aviation fuel is untaxed and air tickets are not subject to VAT (air passenger duty is small by comparison). And the sort of expansion which would require new runways would be ruled out by the UK’s climate change targets. So we are doubtful whether any new runway will be required in the South East. GAL have said they wish to sell Gatwick in around 2018, so they obviously wish to keep the price up by keeping the runway issue open. But if there were any serious plan for a new runway, GACC would mount a massive campaign of opposition. Gatwick has declared its intent to push for a second runway and is to start drawing up detailed plans for government approval. The airport says the runway is “affordable and practical” and will allow it to compete with its bigger London rival, Heathrow, where any runway expansion has been ruled out for now. Although an agreement prohibits any new runway opening before 2019 at Gatwick, the airport is to start detailed work on the options, to be presented to the government’s Davies commission on aviation with a view to getting the go-ahead after the next election. A second runway would increase capacity to 70 million passengers a year and would also mean the construction of a third terminal building. Campaigners warned they would “fight tooth and nail” against any proposal. The plans would eventually double the numbers of passengers at the Sussex airport, which believes its current capacity to grow from 34 million to 45 million with a single runway will see it through until the mid-2020s. The timing of the announcement will push Gatwick to the forefront of government thinking on airport expansion, with the commission led by Sir Howard Davies being assembled to give its verdict on possible new runways in 2015. Heathrow claims there can be only one “hub” airport in Britain – an airport that supports enough connecting flights to make long-haul routes possible – but Gatwick rejects that argument. He said facilities would be ready next year for the larger Airbus A380 planes, while Boeing 787 Dreamliners, which make more long-haul destinations feasible, were coming to the airport soon. Gatwick is committed to the agreement that prohibits physical construction of any new runway before August 2019, but will try to formulate detailed plans and secure planning permission as soon as possible. Land has been safeguarded for construction to the south of the runway, where some houses exist among 17 listed buildings, although there are no large residential areas comparable with Sipson, the village threatened by Heathrow expansion. 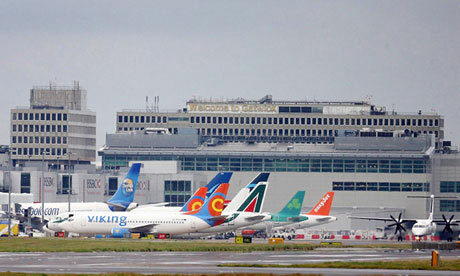 Gatwick will be doing detailed work on environmental impacts such as noise and air quality. While fewer people are directly affected by noise than under the Heathrow flight path, an expanded airport is likely to prompt calls for greater controls and curfews. The airport had always previously officially denied it had plans for expansion, despite publishing a “masterplan” in July this year that broached the option of a second runway in the next decade. Brendon Sewill of GACC, the Gatwick Area Conservation Campaign, said: “The option they have got does not make for a good airport, with no proper space for planes and a new terminal between them [the runways] – unless they’re demolishing part of Crawley. Airline industry sources also questioned whether the intent was to elevate the airport’s value ahead of a sale. “Strong opposition to any new runways will be inevitable – as the last Government found out. “The experience of the last ten years shows there will be opposition from all the large environmental organisations across the country because of the climate change implications – more flights will scupper any chance chance of fulfilling our climate change targets. “And there will always be local opposition – because of the increase in misery for those living under flight paths. Gatwick Airport studies options to build a second runway, which it claims will replace the need for a third runway at Heathrow. Gatwick Airport bosses have started to draw up detailed options for a new runway which could help resolve the UK’s air capacity crisis. But Gatwick said it would honour a 1979 legal agreement that states no runway can be built at the West Sussex airport before 2019. The options, to be submitted to a Government-appointed aviation commission, will assess the environmental and economic impacts of a new runway. The chief executive of Gatwick, which serves 197 destinations and handles around 34 million passengers a year, said a new runway would benefit passengers. “I believe a new runway at Gatwick could be affordable, practical and give passengers a greater choice of routes to key markets,” Stewart Wingate said. London’s busiest airport, Heathrow, is operating close to full capacity after the Government blocked a third runway because of the resulting increase in planes flying over the city. Mr Wingate said a new runway at Gatwick had “clear practical advantages” over expansion at Heathrow. “When compared with a third runway at Heathrow, we would have a significantly lower environmental impact whilst adding significantly more capacity,” he said. He added that it would also be preferable to other London alternatives. “Stansted is half empty today, we already have much better surface transport links and feel our business case will be much stronger,” he said. But the Gatwick Area Conservation Campaign has always been opposed to a second runway at the airport on environmental grounds. “We have had massive support from across Surrey, Sussex and west Kent,” Gatwick Area Conservation Campaign’s chairman, Brendon Sewill, said following the announcement. “We have been supported by all the local MPs and all the county, district and parish councils in a wide area. Gatwick has safeguarded the land that would be required for a new runway since it was bought by Global Infrastructure Partners in 2009. It estimates that for the rest of this decade, London’s airports will be relying on their existing physical capacity. As such, its submission to the commission will evaluate how the capacity of its existing runway can be maximised. It will also argue that a second runway would help ensure that London’s airports provide the South East and the rest of UK with the connectivity needed in the future. The commission, led by the former head of the Financial Services Authority Sir Howard Davies, will make its full report into the South East’s airport capacity in 2015. Conservative-led Surrey County Council have rejected plans to build more runways at Heathrow and Gatwick, due to their concerns about the impact on the environment. It will write to the transport secretary, Patrick McLoughlin, to say it is against airport expansion. Council leader David Hodge said SCC opposed any plans to build additional runways “out of line with the existing county council policy”. SCC had a policy agreed in March 2008 opposing expansion unless there was “comprehensive and creditable investment” satisfactorily addressing environmental issues. Lib Dem councillors said the airports have reached their limit. They want alternatives elsewhere to increase in UK airport capacity. Opposition leader Hazel Watson said increased capacity at Gatwick would lead to the loss of “precious countryside” and “irreplaceable historic buildings”. Posted: Wednesday, October 17th, 2012. Filed in News about Airports, Recent News.